From the very first collection of wrist watches by Alain Silberstein launched in 1986, his products were considered the best on the market. Silberstein became famous for the unique and authentic design and assembly of meticulously crafted timepieces. He was the pioneer in adding bright details and colors to dials to make them look unconventional. Silberstein and his wife Sylvie run the business together and managed to add some fun and fresh features into the strict and highly traditionalist sphere of watch manufacturing. The brand produces a limited number of timepieces, which makes its old models priceless among Haute Horlogerie connoisseurs. An increasing number of collectors from all over the world is striving to get as many bright and innovative Alain Silberstein used watches for men and women as possible. One needs to admit that Silberstein managed to find an unconventional approach to the creation of classical wrist watches, and his risk was justified. The most frequently used colors of Silberstein timepieces are red, yellow, and blue, in contrast to traditional, yet somewhat boring black, gold, and silver colors of classic watches. Only one look at marvelous details decorating numerous products of this famous brand will make you fall in love with the eye-catching and bold design. A finely decorated movement with red triangle hour-hand and blue minute-hand together with strict and minimalistic design will certainly attract the attention of people who are not afraid to be different. Due to the limited production of Alain Silberstein watches (only 3,000 items are manufactured every year), you can be sure that once you wear this masterpiece, you will stand out from the crowd and attract lots of inquisitive glances. Despite the fact that the number of manufactured items is limited, you still can find a great variety of different product lines such as ladies’ watch collection with precious gems and extravagant men’s watches with a range of advanced features that every man will appreciate. 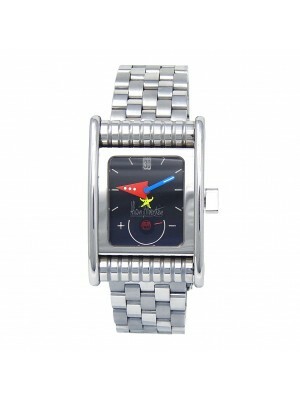 One of the best models of the famous brand is iKrono Watch with a square-shaped body made of titanium. 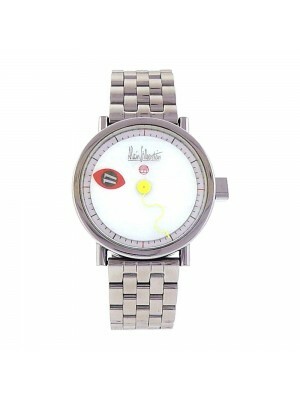 This great timepiece looks adorable with its round dial and bright hands. The titanium part of the watch is covered with silicon anti stain treatment to protect the material from little scratches, grease, or anything that can spoil the appearance of these timepieces. Despite the somewhat brutal design, this watch would look great on your wrist. One can choose several color versions of these models – the red, blue and yellow dials make even gray watches bright and funny. One may think that the timepieces of this unique and creative brand look like a children’s toy, but this is not exactly so. These are high-end watches with sophisticated Swiss automatic mechanisms and uncompromising quality. Overall, luxury and extraordinary watches of this famous company are perfect for tech lovers and watch connoisseurs. If you are an active person who prefers unique items that are produced limitedly at a reasonable price, have a look at the catalog of Silberstein products and buy one! Be different and free to express your individuality!